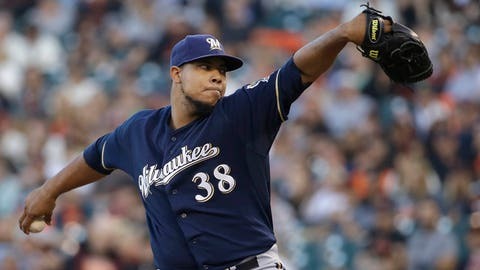 Milwaukee hands the ball to starter Wily Peralta for Sunday's rubber match. Wily Peralta says he’s feeling fine, but the Milwaukee Brewers are skeptical. He’s nowhere near those numbers in 2015, thanks in large part to a two-month stint on the disabled list because of a strained left oblique. Peralta is 3-3 with a 5.52 ERA in six starts since returning, but his performances in the last two were worrisome for the Brewers (54-75). He’s gone 1-1 while surrendering 10 runs in 7 2/3 innings with five walks. His velocity was down while he turned in his shortest outing of the season Tuesday, allowing four runs — two earned — in 2 2/3 innings of an 11-6 loss at Cleveland. "I’ve never had that (problem) before, but I don’t really worry about it because I feel pretty good," Peralta told MLB’s official website. "My arm doesn’t feel tired. Sometimes it’s mechanics. . . . Mechanically, I was a little off, and sometimes that takes off from your velocity. But overall, I feel good." "My thought process is that (it is) maybe, possibly, a dead arm," pitching coach Rick Kranitz said. "You’ve got to throw through it. If he’s fine, he’s fine. You just have to pitch. You have to go back out there and go, and he needs to go back out there and pitch and be who he is. That’s throwing 94-97, 98. That’s the guy he needs to be." Peralta has struggled with Joey Votto, who is 7 for 21 against him over the past three years — including a two-run blast in April. Votto’s third and final hit Saturday was a go-ahead, two-run shot in the ninth which helped the Reds win 12-9 and end their five-game slide versus Milwaukee. He’s a .362 hitter with 10 homers and 31 RBI in his last 34 games at Miller Park. The Reds are turning to John Lamb (0-2, 6.06), who has completed six innings in just one of his three starts — all Cincinnati losses. Lamb struggled with the Dodgers again in Tuesday’s 5-1 loss. He labored through 108 pitches in five innings, giving up three runs with six strikeouts and three walks while also hitting a batter. "Without a doubt I’d like to take the club deeper into the game," Lamb said. "It’s definitely a learning experience. I can learn what pitches to throw, but then I have to execute them. I’m learning to continue to make pitches and apply the pressure.